Oh, tempeh. I love tempeh! I have been looking for a good vegetarian meat-like protein since my decision to switch off of animal products. Since I’ve discovered tempeh, I know that my transition is going to be easier. Tempeh has, gram for gram, the same amount of protein as beef, without all the nasty cholesterol and cruelty. It’s kind of a win for me and the world. I love its hearty, almost nutty texture. It also marinates well, so I can load it with flavor! Earlier this week, my awesome girlfriend made some crazy good tacos with gluten-free tortillas, and a couple of days later, this amazing burger. Tell me that this doesn’t look good. Slice tempeh in such a way that would fit on your sandwich bread. You want to be sure to cut it through the thinnest part of the block so it’s half as thick. Whisk marinade together and place in an 8×8 casserole dish. 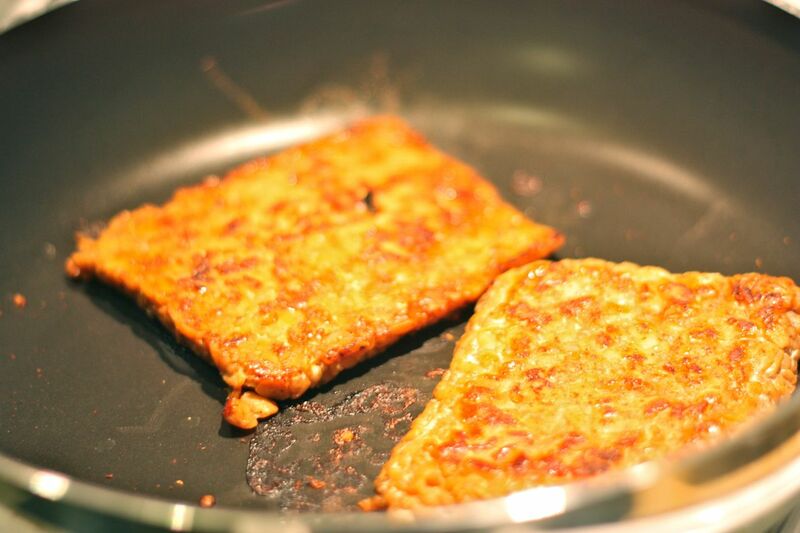 Coat each piece of tempeh and place them in the dish in one layer not covering each other. Marinate for at least 2 hours flipping a few times. Heat oven to 350 degrees F. Drain out most the marinade from the tempeh, leaving a little at the bottom of the pan. Save marinade. Bake for 15 minutes, thin flip each piece and add a little marinade to the pan if it’s dry. Bake another 10 minutes. Split the tempeh between 2 sandwiches and pile bread with your favorite toppings. Enjoy!